Fowey is an ancient port located on the south coast of Cornwall between Looe and Mevagissey. Pronounced FOY (as in JOY), the town takes its name from the adjoining river which was named from the Beech trees that once grew in the area. The town sits on the west bank of the river which widens at this point to form a deep natural harbour. In ancient days Fowey was famed for its smugglers, pirates and privateers but today is known more for its quaint narrow streets, picturesque quays and busy harbour, full of peaceable yachts and motor vessels. The men of Fowey are born to seafaring. In the days of sail, local businessmen would hire-out their ships to the king to assist various war efforts. After the port was attacked by the French in 1457, a defensive castle was built on St Catherine's Point, at the harbour entrance. This proved its worth in 1667 when a Dutch attack was successfully driven off. The well-known authoress Daphne du Maurier lived for many years at Menabilly to the west of Fowey and drew much of her inspiration from the surrounding countryside. There are dramatic views from the headland across St Austell Bay and you can walk down through narrow country lanes down to Polkerris, a village with a popular beach. 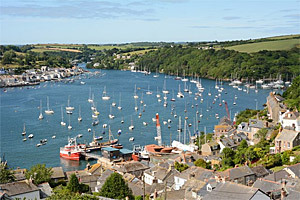 The village of Polruan on the opposite bank from Fowey can be reached by a regular foot ferry. Polruan is an ancient fishing village with a strong boat building tradition. The narrow village streets, alleys and flights of steps make it an interesting place to visit. A car ferry runs across the river from Fowey to Bodinnick. Here beside the slipway you will find Daphne du Maurier's old house, Ferryside. Bodinnick has a 400 year old Inn and from this point you can take the half mile walk down to a sheltered cove and then on along the coast path to Polruan and eventually to Polperro to the east. Just a couple of km away, Par Sands is a large safe beach particularly good for children. Par itself has a mainline station and is a good base for visiting the nearby Eden Project. Lerryn is a tiny village set at the head of a peaceful wooded creek in the upper reaches of the Fowey. There is a pleasant pub and stepping stones cross the river between wooded banks. If your hobby is painting make sure you bring your watercolours when you visit this delightful spot. Nearby is the small hamlet of St Winnow with its romantically sited church beside the river.